Google has an extensive list of corporate social responsibility (CSR) initiatives. Specifically, Google is focusing on generating youth-led social initiatives in China. Google encourages young people in China to take on leadership roles and actively participate in socially responsible activities by competing in the Google China Social Innovation Cup competition. 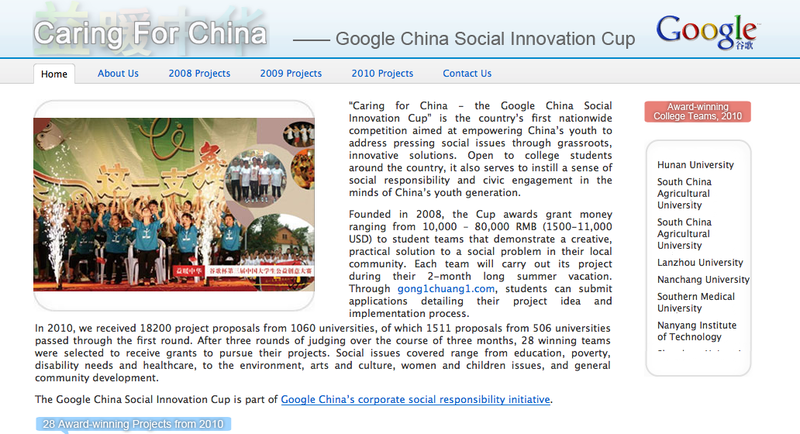 Google China Social Innovation Cup for College Students is a competition aimed at empowering China’s youth to become agents of social change. College students submit project ideas and funding proposals aimed at specific focus areas such as poverty or education. The top 100 proposal submitters are awarded Google “Campus Volunteers Stars” scholarships every year. Google has also played a significant role in supporting relief efforts in China after the 2008 earthquake.